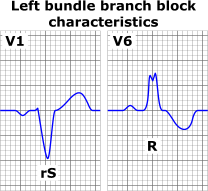 Left bundle branch block (LBBB) is a cardiac conduction abnormality seen on the electrocardiogram (ECG). In this condition, activation of the left ventricle of the heart is delayed, which causes the left ventricle to contract later than the right ventricle. The presence of LBBB results in that electrocardiography (ECG) cannot be used to diagnose left ventricular hypertrophy or Q wave infarction, because LBBB in itself results in widened QRS complex, and changes in the ST segment consistent with ischemia or injury. ^ "Lesson VI - EKG Conduction Abnormalities". Retrieved 2009-01-07. ^ "more detailed information about left anterior fascicular block". GPnotebook. ^ "more detailed information about left posterior fascicular block". GPnotebook. ^ Emily Groepper; Nasar Nallamothu; Wilfred Lam; Frank Aguirre; Kristi Bergman; Patricia Good; Patricia Wright (May 13, 2014). "Electrocardiography > Left Bundle Branch Block (LBBB)". Southern Illinois University School of Medicine. Retrieved 2015-07-02.